Frame Relay. Important Topic within the network world. I am a little overwhelmed with its operational modes, especially surrounding OSPF and Frame Relay. I am getting there but it is definitely slowing my progress down. Had hoped to be into Route Redistribution/Manipulation and making head way into BGP. Anyone found a good way to help remember Frame Relay concepts? Today we go through the example of Thunder Hawk Down. Apologies for the slow reply. I had my engagement party on Saturday night and found myself busy getting ready last week. Just recapping on the objectives. – Configure RID’s/Interface IP’s and Loopbacks. 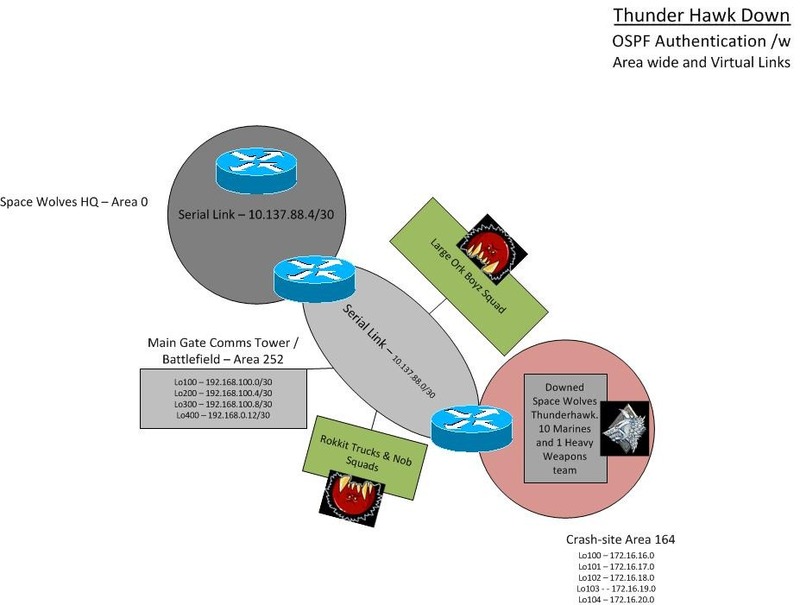 – Establish an OSPF link from Space Wolves HQ Area 0 to Main Gate Comms Tower Area 252. – Secure the link with the strongest authentication possible. – Establish a Virtual link for Area 164 back to Area 0. – Verify and inform the Icebane to hold on. Here under each router I configure the Hostname to allow for identification of devices. Under line con 0 I configure no exec-timeout. This means my console session will no log out. This is great for GNS3 as idle-pc values stop working and my CPU maxes to 100%. Never use no exec-timeout in a production environment. Logging synchronous stops console messages from interrupting you whilst you type. Here I have configured the IP addresses according to the scheme. I have added descriptions to help identify links. The ip ospf network point-to-point command advertises the proper subnet mask into the routing table. Confirm links are up and up with show ip int br. Initiate the OSPF Process on the routers. Confirm configuration. It is important to set the router-id. This comes in handy for a number of things such. Reading outputs and confirming changes in the OSPF process. In our case, we need it set for the Virtual Link to re-establish communication to the Icebane. Configure OSPF Virtual Link between Icebane and MainGate. Communication must be authenticated. A sense of urgency has frenzied the Orks. We must securely re-establish contact with our brethren. A quick set of commands will allow connectivity to the downed bird. It is extremely important to set this up correctly. Under the OSPF process you must enable area-wide authentication. This is done on each other. In the case of MainGate there is an interface in each area. This means the command must be entered for each area the BDR sits in. This is demonstrated by the area 0 and area 252 commands. MD5 must be configured area wide then on the virtual links. The Virtual Links authentication type must match the area authentication type. In this case we need a secure link so we are going to use Message-Digest. Area 252 virtual-link 3.3.3.3 command on the MainGatec creates the virtual link. On Icebane, it must be configred as 252 virtual-link 2.2.2.2. The reason Icebane uses area 252 is that the virtual link must be configured with the area that it traverses to reach Area 0. Adding on the message-digest-key 1 md5 spacewolf ensures that the md5 authentication is used on the virtual link. The number 1 stipulates the key #, md5 the type, and the passkey of spacewolf. The passkey is case sensitive. Under each interface the command ip ospf message-digest-key 1 md5 spacewolf command must be issued. This specifies md5 authentication using key 1 and the type of auth as md5. The use of the passkey spacewolf is used here. The second line states that OSPF_VL0 (the virtual link we set up) to 3.3.3.3 (Icebane) is up. The second last line shows MD5 is being used and the key number 1 which we set to use the passkey of spacewolf is being used. Voila! Connection to area 0 and 252. This is show by the connection to 10.137.88.4 network (Serial link from HQ to MainGate). A quick ping to confirm. A foul stench permeated the air. Blood, Bile and bullet casings were scattered amongst the green tide. The surging sea of Greenskins had been calmed to a pool of death. The sight before the Space Wolves was enough to turn the most seasoned warriors bowels to water. Yet, they moved onwards with a sense of loss setting in. “Co…Comm…Darius” a meek voice called out in amongst the sea of Orks “Thank you”. It was Captain Jelk of the 2nd Heavy Division. He had been severely injured and desperately required a medic. With communications restored, a Thunderhawk with the Clans Apothecaries arrived on site within minutes and plucked the stranded and injured troops to safety. Again, another great book of the day. Help bridge the New word old world divide with SIP Trunking. This book in the VoIP series is one for the collection. Series: Networking Technology: IP Communications. The first complete guide to planning, evaluating, and implementing high-value SIP trunking solutions Most large enterprises have switched to IP telephony, and service provider backbone networks have largely converted to VoIP transport. But there’s a key missing link: most businesses still connect to their service providers via old-fashioned, inflexible TDM trunks. Up next, the answers to Thunder Hawk Down. 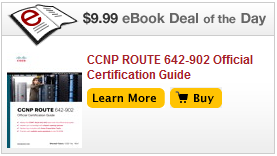 Ciscopress.com offer the book of the day. Digital copies of their books for $9.99. Massively reduced, these e-books come personalized with your name. For the past couple of days, the CCNP ROUTE 642-902 OCF has been up for sale. Good price for a good book. Great for the iPad or Laptop. The sickening screech of scraping metal roared up the embankment on the horizon. Blood curdling screams of terror. brought home the stark reality of the situation. Thunder Hawk Icebane succumbed to Ork Rokkit Fire. “Brother Commander Darius Longfang, deploy the links and secure the channels. We need to re-establish contact with the Icebane.” a voice crackled down the vox caster. As the Wolves pushed their advance, the Orks proved to be a endless green tide of destruction. It was only a matter of time before Icebane was overwhelmed and the survivors of the crash surrounded and killed. Communication must be made to inform them that help was on its way. – Good Luck Brother Captain. I will post the answers shortly. We the undersigned ask Cisco to consider our petition for an open and usable IOS Emulator for learning, study and training. We are the people who are learning about Data networking and Cisco IOS software. As students and practitioners, we need to learn theory and knowledge and then to take that knowledge and practice on Cisco IOS software. We want to be able to practice that knowledge, and demonstrate our competence. We know that you are considering the value. This petition is to show our need for this solution. Wendel Odom discusses the possibility Cisco Considers IOS for Certifcation Self Study and we are calling for Cisco to make an option available. This experience and knowledge we gain gives us the capability to make the most of Cisco equipment for our employers, your customers. We help drive the best return on investment, and keep the network performing in the way that your customers expect. We can test configurations prior to making and be better prepared. We can develop more complex configurations than would otherwise be possible, and not blame the equipment afterwards. We resolve problems more quickly, we make better designs and we have greater confidence in our work. We raise less support cases (and reduce your costs) by being to perform our own testing and validation. Whether we are resellers, consultants, students or just interested in learning, we all need an practical method to access IOS and practice. Therefore, we are asking Cisco Systems to make a version of IOS available for educational and testing purposes. OSPF Authentication– Clear Text vs MD5. What is the difference? Grimnar’s Black Fangs. Magingald IV. OSPF authentication is setup under the interface. The command ip ospf authentication enables clear text authentication. Next command specifies the key, in this case cisco. The neighbors with expire due to authentication mismatch. Now the same is configured on the opposite link and the neighbors agree on authentication and establish a neighbor relationship. 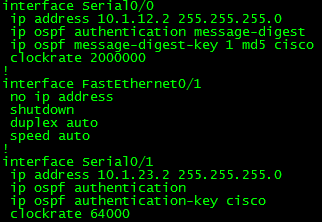 The command show ip ospf interface serial 0/0 shows that Simple password authentication is enabled. Dangers lurk from beyond the void. If heretics manage to infiltrate the network a simple packet capture could be all that stops them from joining the OSPF process and tampering with your links. 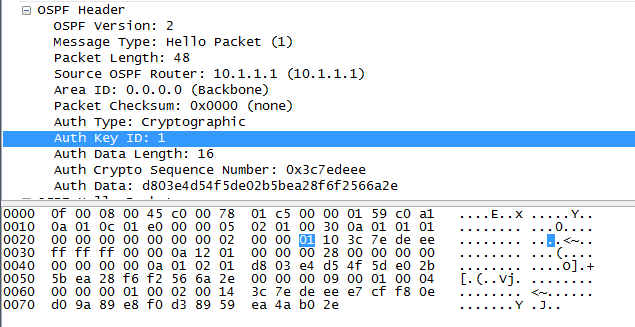 This capture of a OSPF hello packet shows the Auth Type: Simple Password. Also shows the Auth Data: cisco captured from the Hex information. 636973636f000000 translates into cisco. This is bad and a major security flaw that Fang Leader Grimnar wanted addressed. 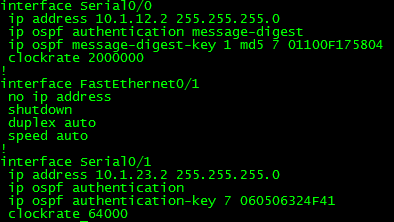 The ip ospf authentication message-digest command initiates MD5 hashing on the pass key. This is replicated on the other end of the link. The link expires and then comes back online using the MD5 key. Above is verification of the implementation of the MD5 key. Show above is the packet capture of the MD5 key in use. Before it had the plain text key of cisco clearly visible. Now there is Auth Type : Cryptographic which states cryptography is being used. Auth Data this time is hashed. No easy password extraction this time. Here is the show running config of the router. Look there. Although we are using MD5 authentication out password is still visible. If the heretics broke into our config our Chapters passwords would be compromised. This command will hash and ‘hide’ the passwords we using throughout our routers. Any password stored in clear text will be hashed. As mentioned prior, the clear text passwords are now stored in a more secure fashion. As our landing party has made it’s beachhead we now have established secure communication between our landing craft and the landing zone. Well done Brothers. 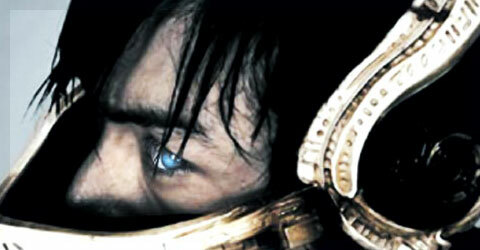 This day is for the Emperor.